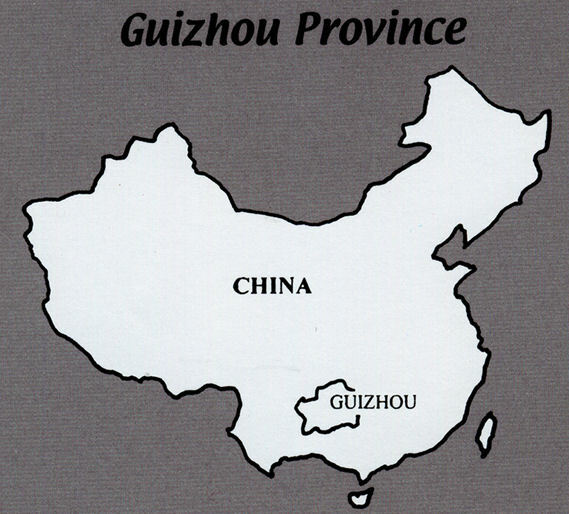 Guizhou is a mountainous province and one of China’s most diverse, with over 14,000,000 people designated as ethnic minorities. Due to the mountainous geography and ethnic diversity, cultural traditions have remained strong and many minority women still make their festival garments and baby carriers in traditional ways. Each minority group has distinctive dress that identifies them with their group and even their village. Still today, women spend long hours making their festival costumes and baby carriers. Baby carriers are one of the first items a new bride might embroider. Great time and love goes into making baby carriers and hats that act as talismans to protect the child and ward off evil. Embroidered symbols express promises for good health and fortune, while bells and pom-pons ward off evil. Each minority group favors particular symbols that tell their stories. Some symbols, such as the butterfly, are used by many groups, but retain separate meaning. The Butterfly Mother is important in the creation mythology of the Hmong (Miao), so the butterfly symbols used on their baby carriers hold specific importance as well as expressing good fortune and health. The legend tells that the gods created the earth and planted many maple trees. A butterfly flew from one maple tree and laid 12 eggs. One of the eggs hatched and gave birth to Jian-ian, who gave humans the ability to procreate. The butterfly is therefore the creator of all living beings and brings children good luck and good health, while granting women the power of fertility. For the Hmong (Miao) in particular, dragon symbols are very important. Dragons come from one of the eggs of Mother Butterfly and live among the people. Dragons are associated with rain, affecting the growing of rice and other important crops. Hmong (Miao) dragons come in many forms, with greater power given to animals that have changed into dragons. Other dominant symbols are birds, flowers, fish, and coins. Cotton is the most common fabric used for the ground cloth of garments and baby carriers. Some women start from the cotton fiber grown in their own fields, spin the fiber, and weave the cloth, sometimes in intricate patterns. Yet this is just the beginning. Natural indigo and other dye plants are grown, gathered, and prepared for dyeing. The cotton is dyed in the indigo vat numerous times to create a deep, almost black, color. In many of the regions, the dyed cloth is pounded to make a firm paper-like fabric. A sheen is added to the fabric by brushing on a mixture of herbs and egg white, pigs blood or water buffalo skin extract, and sometimes pounding the cloth between brushings. The cloth is then cut into pieces to create the garment or baby carrier style of the village. If the pieces are to be embroidered, they are done so at this stage while the work is easily transportable. It is common to see women working together, in homes and public spaces, embroidering pieces of cloth. Some ethnic groups, in addition to embroidery, create designs using the wax-resisted batik process; once the pattern has been drawn with wax, the cloth is dyed in the indigo vat. Braids and ribbons are also woven by hand. In some areas, the braids are couched on in various fashions as decorative three dimensional elements. Ribbons are used as belts, decorative elements, and ties for garments and baby carriers. In a few areas, women raise silkworms and extract the silk from the cocoons. These threads are used to embroider, to weave sashes, or as a supplementary warp in the fabrics. Silkworms are also raised for the production of a silk “felt” cloth. Here, the silkworms are not allowed to make a round cocoon, but are forced to run their cocoon threads on a flat surface. The created sheet of silk, a non-woven fabric, is then dyed and cut into designs to appliqué on fabrics or to serve as a ground fabric for embroidery. Baby carriers must have long straps to wrap around the wearer, under the child, and then back around the wearer to tie in front. The straps of two baby carriers in the exhibition have been removed. Sometimes, a mother will want to keep the straps of the baby carrier – even when the decorated central panel is worn out or sold – as a reminder of the bond between the mother and child. 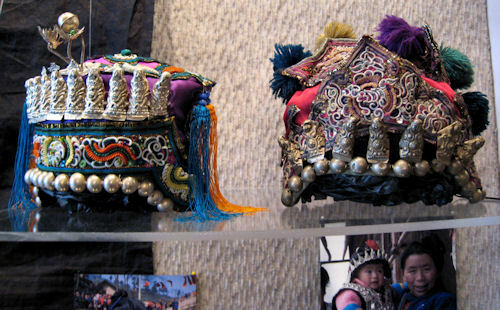 The baby carriers, baby hats, and costume in the exhibition were acquired during two research trips to Guizhou Province in 2004 and 2006. Mary Ann Fitzgerald is currently the exhibitions coordinator at the Chazen Museum of Art at the UW-Madison. She received her B.S. degree from Iowa State University in Textiles and Clothing and her M. A. from the University of Washington in Anthropology, with an emphasis in museum studies. For her thesis, she spent a year in India researching village textile traditions. In Seattle, Washington, she held positions and curated textile exhibitions at the Wing Luke Asian Museum and the Henry Art Gallery. At the UW-Madison, she was the curator of the Helen Louise Allen Textile Collection for ten years. 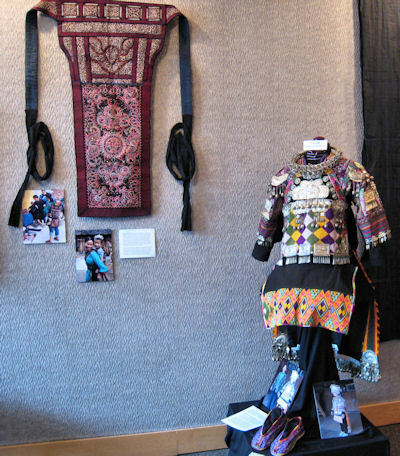 Since moving to the Chazen Museum of Art, she brought to Madison the exhibition “Writing with Thread”, featuring traditional minority costumes from southwest China. She continues to travel extensively in search of living textile traditions in India, Pakistan, Nepal, Indonesia, and most recently Guizhou and Yunnan Provinces in China.